In an earlier article on Winslow Homer’s nineteen months stay in Cullercoats, on the English north-east coast, I mentioned some remaining puzzles. His production during that time also changed considerably. As most of his sketches and paintings are signed and dated by year, I have looked at the dates attributed to them for the paintings which I have shown here. Twenty-four, almost three-quarters, are dated 1881, and only eight in 1882. The great majority of his paintings included in the references were also dated 1881. Does this mean that he painted fewer in 1882, that many of those painted that year have been lost or destroyed, or that private collectors have amassed his work from that year disproportionately? I have now been able to analyse the drawings and paintings listed by the late Tony Harrison in his monograph on Homer’s sojourn in England. Throughout this, I will assume for the sake of simplicity that none of those works has been lost or was destroyed, thus that Harrison’s list is a complete account of Homer’s work in and on English locations. Excluding rough sketches and undated works, Harrison shows a total of 85 paintings made in England or using motifs from his stay in England, of which 24 were drawings, 54 watercolours, and 7 oils. In 1881, he made only 5 drawings, but 31 watercolours, and 2 oils; the following year he made 15 drawings, 9 watercolours, and three oils, including Hark! The Lark! (1882) for exhibition at the Royal Academy in London. 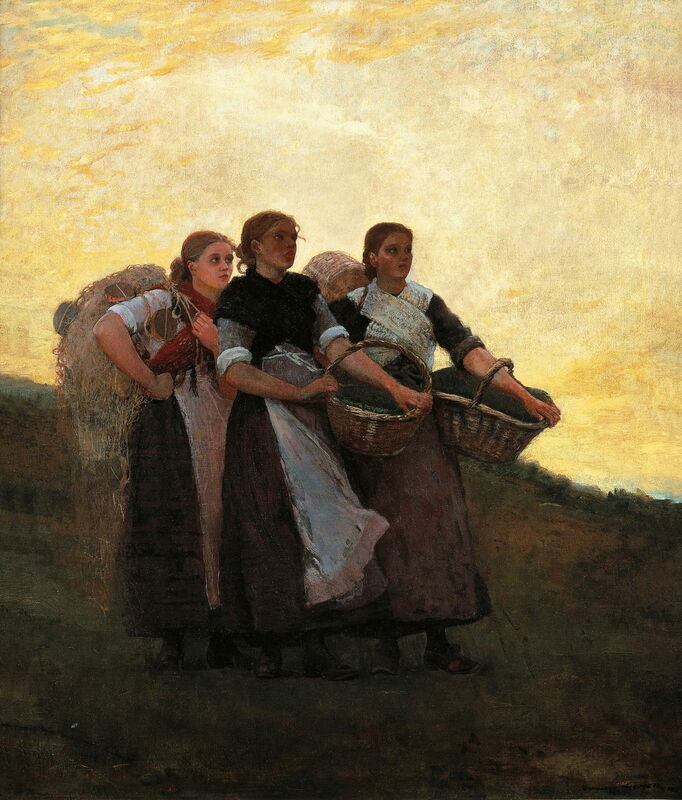 Winslow Homer (1836–1910), Hark! The Lark! (1882), oil on canvas, 92.39 × 79.69 cm, Milwaukee Art Museum, Milwaukee, WI. Wikimedia Commons. This is a curious reversal of what might have been expected, with earlier production of more drawings, and later of more watercolours and oils. Of the 54 watercolours he produced, 57% date from 1881, 17% from 1882, and 26% from 1883, when he was back in the USA. In 1881, he painted an average of 3.4 watercolours per month, which fell to less than 1 per month in 1882. Looking at the main themes in his drawings and paintings, 10 out of his 11 complex motifs with fishwives and boats were made in 1881, when his work was more varied and included 3 of fishermen in oilskins, and 3 of fishermen and boats, for example. In 1882, nearly two-thirds of all his works were of women walking and watching (1881, only 21%). Harrison reviewed previous considerations of Homer’s activity during the winter of 1881-2, and concludes that there is good, but not conclusive, evidence that Homer was away from Cullercoats for a period between late November 1881 and February 1882. He suggests that Homer did not return to the US, but met with his brother Charles and his wife in France. 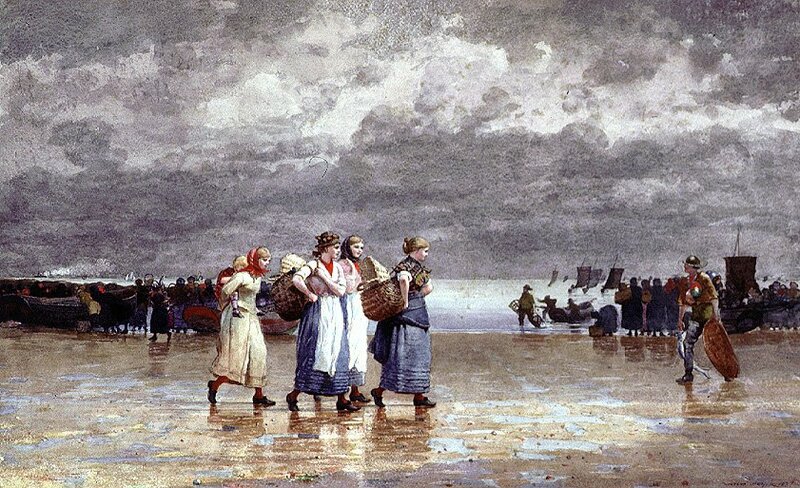 Unfortunately this still does not explain the very small number of watercolours which remain from Homer’s work in 1882, as it only shortens his time in Cullercoats in 1882 from 10 to 8 months, for which a total of 9 watercolours remains exceedingly low, and low in comparison with his output the previous year. One explanation may be in the dispersal of his paintings from the two years. In October (or early November) 1881, Homer sent 30 watercolours to his New York agent, J Eastman Chase, via Samuel T Preston of New York. These included his watercolour output for 1881, except for the Wreck of the Iron Crown (1881), which was sent in February 1882. Together, these match the 31 watercolours recorded by Harrison for 1881, suggesting that (almost) all are accounted for and still exist today. There do not appear to be any records of the shipping or dispersal of Homer’s watercolours painted in 1882. It is quite feasible that the majority of them did not arrive in the US, or perhaps that, on arrival, the majority was purchased by a single collector, whose collection has yet to become known. 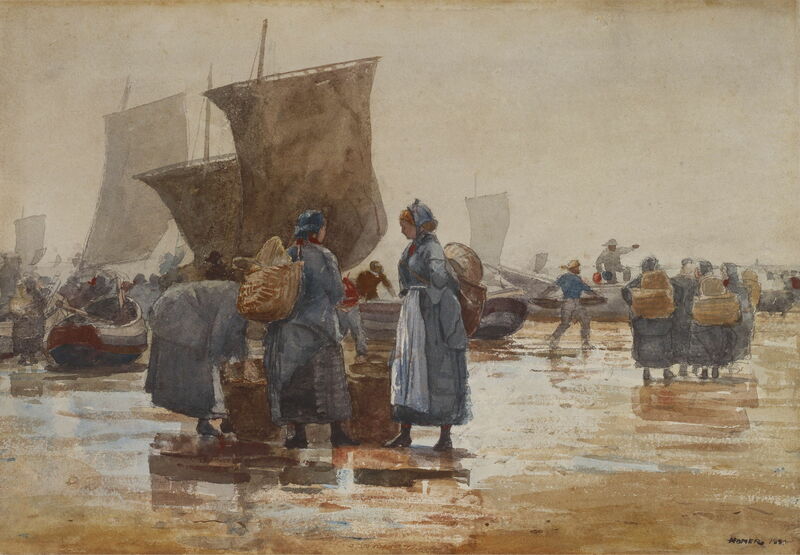 I would hazard a guess that those potentially missing watercolours include a wider range of motifs, including complex scenes of fishwives with boats, and some more showing fishermen. 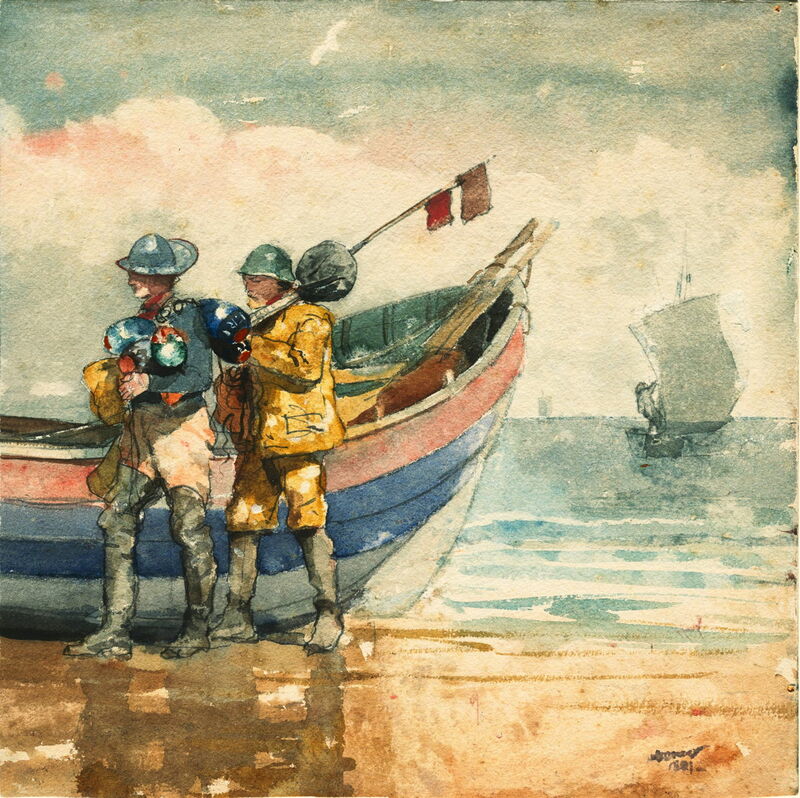 Now there’s a tantalising thought, that someone somewhere might have a number of unseen watercolours painted by Winslow Homer in Cullercoats. Harrison T (1983, 2004) Winslow Homer in England, Hornby Editions. ISBN 978 0 9636 4143 4. Posted in General, Painting and tagged Cullercoats, Homer, painting, watercolour. Bookmark the permalink. I think I have a watercolor from Cullercoats but it is not signed. I am trying to find out who do I contact to have it evaluated. In the first instance, get a high-quality high-resolution image made of it, and contact your nearest major museum or public gallery to discover their 19th century painting specialist. In some cases, you may strike lucky and find someone who knows watercolours of that time well, or even someone who known their Homer. Unless you particularly want to sell, I would avoid commercial galleries/dealer/auction houses as they tend to look for sales. I wish you success – please let us know the outcome, it sounds rather exciting! Thank you – my email address is given in the About page, which is accessible from every page here. Sorry, I don’t know Abigail Gerdts, but if you have access to LinkedIn, I think that you’ll find her there.